Mounted orchids typically need to be watered frequently. Most often, you'll need to water daily, though frequent misting may allow you to water a bit less often. If you're growing them in a greenhouse, or an under-lights setup with a drain in the floor, you can water them easily with a hose. Otherwise, dunking the plant in a bucket of water is the easiest way to water. I like to leave them in there to soak for several minutes a couple times a week. Fertilizing mounted orchids is most easily done with the bucket method, unless you have the ability to inject fertilizer into a hose system. If growing orchids mounted, you need to make sure the humidity is high enough, so that the roots' velamen can absorb moisture from the air. I suggest 70% humidity for most orchids; 50% is a reasonable minimum for plants with very exposed roots. Sometimes, a wad of sphagnum moss is placed around the plants' roots to retain moisture somewhat longer. 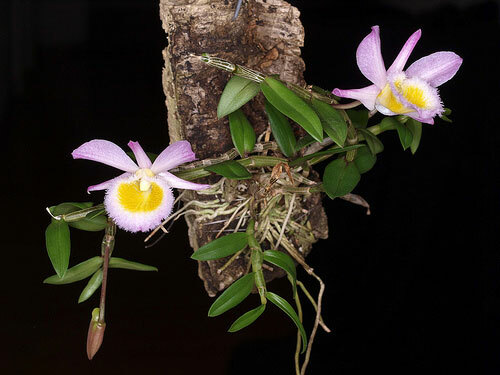 Do this with orchids that like to remain moist, such as pleurothallids and Odontoglossums. Plants that want to dry quickly, such as Ascocentrums and Brassavolas, should have their roots more exposed. Pieces of tree fern are often used as an alternative to bark; they retain more moisture and so will dry a bit more slowly. They can also be set in a very shallow tray of water and will slowly wick water to the plant's roots (desirable for plants that like to stay moist, such as Bulbophyllums). Of course, you can grow orchids on almost anything that doesn't rot or leach harmful chemicals. Found an animal skull in the woods? That might look really interesting with an orchid growing on top of it! Be creative with your plant's presentation! Repotting mounted orchids can be difficult, as you'd pretty much have to destroy the root system to detach it. Instead, tie the old slab to a new one with fishing line. If you're moving a plant from a pot to a slab, spread the roots out, add any moss you intend to use, then tie it all down with fishing line wrapped around the slab. Once the plant has grown firmly in place, the fishing line can be removed if you choose to do so. Mounted plants are usually grown with the slab of bark hung vertically. This can save space if you place them all on the same wall of your growing space, but if you place the mount horizontally instead, fertilizer will be retained better when you water. Experiment with both orientations and see what works best for you.